Is Global Warming Changing the Arctic? And will polar changes trigger climate shifts beyond the Arctic? In 2005, the ice cap covering the Arctic Ocean shrank to its smallest size since researchers began keeping records a century ago. In the past five years, scientists reported that many Greenland glaciers are sliding faster to the sea and melting at their edges. Climate simulations indicate that the buildup of greenhouse gases in the atmosphere will accelerate melting. Are these temporary phenomena or the first hints of long-term climate change? The answers are critical because the Arctic will not just feel the impacts of climate change, it will also cause a cascade of other global changes. As the Arctic goes, most scientists say, so goes the planet. In the Arctic, the air, sea ice, and underlying ocean all interact in a delicately balanced system. To understand why, you have to follow the water. It starts at the narrow Bering Strait between Alaska and Siberia, where cold and relatively less salty water from the Pacific Ocean enters the largely enclosed Arctic Ocean. In winter, frigid winds from the icy Alaskan interior blast over the shallow Chukchi Sea. The cold air freezes coastal seawater into sea ice and then pushes it farther out to sea, leaving new pockets of seawater available for freezing. This is “the ice factory,” which, in the process of manufacturing ice, also transforms the seawater left behind. When seawater freezes, it releases salt into surface waters. These cold, salty waters become denser and sink, spilling over the continental shelf into the basin of the western Arctic Ocean. They create a layer known as a halocline (from the Greek words for “salt” and “slope”). 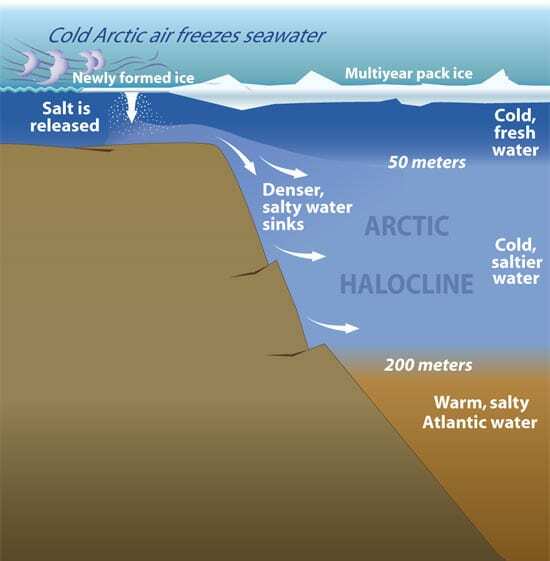 Halocline waters lie atop a deeper layer of saltier, denser—and warmer—waters that flow into the Arctic from the Atlantic Ocean. Once in the Arctic Ocean basin, the water is swept into a mammoth circular current—driven by strong winds—called the Beaufort Gyre. Mighty Siberian and Canadian rivers also drain into the gyre to create a great reservoir of relatively fresh water. Winds trap this water in a clockwise flow, but periodically, the winds shift and the gyre weakens, allowing large volumes of fresh water to leak out. This is “the flywheel,” said WHOI physical oceanographer Andrey Proshutinksy, and when it turns off, fresh water flows toward the North Atlantic. The water exits the Arctic Ocean via several “gateways.” It can flow through the Fram Strait, between northeast Greenland and Svalbard Island, and then branch around either side of Iceland. It can flow around the west side of Greenland through Baffin Bay and out Davis Strait. It may also flow through a maze of Canadian islands and out Hudson Strait. These gateways are two-way: They also let in the warmer Atlantic waters that—if not for the halocline—could melt Arctic sea ice. Melting sea ice has consequences. If the sea ice disappears, heat from the sun—which mostly reflects off white ice surfaces and back into space—instead would be absorbed by the ocean. This would further accelerate the warming of the Arctic. More warming means more melting: If the permafrost across the Arctic tundra melts, it could release vast reservoirs of methane, a greenhouse gas that can trap 10 times as much heat as carbon dioxide. If more Greenland glaciers melt, more water will pour into the oceans and raise global sea levels. Melting sea ice also means more fresh water in the ocean, which could flood into the North Atlantic. That could disrupt a global system of currents, known as the Ocean Conveyor. The Conveyor brings warm, salty Gulf Stream waters northward, where they release heat to the atmosphere in winter and temper the North Atlantic region’s climate. The waters then become cold enough again to sink to the abyss, propelling the underside of the Conveyor. That is especially true in the Arctic, whose frigid, sunless winters, remoteness, and ice cover make expeditions difficult and expensive. The ice presents another barrier: It is difficult to build instruments that can penetrate it or survive it for long periods. Enter Gary Comer, founder of the Lands’ End clothing-catalog company and an avid open-ocean sailor. In 2001, while attempting to navigate the Northwest Passage in his yacht, Comer was stunned by the dearth of sea ice in the Arctic Ocean. Seeking answers, he contacted Woods Hole Oceanographic Institution. The Comer Science and Education Foundation donated substantial support to the WHOI Ocean and Climate Change Institute, which used some of the funds to launch three ambitious Arctic projects—led respectively by Plueddemann, Proshutinksy, and Straneo. All involved designing, building, and field-testing high-risk, high-reward oceanographic instruments to help pull back the icy veil shrouding our understanding of the Arctic Ocean’s role in our climate system. Under-ice Floats Offer a ?Breakthrough?